My lovely, wonderful man outdid himself again for our three year anniversary. I told him that at this rate we’d better be riding dolphins off into the sunset next year, whilst being serenaded by mermaids. The only downfall so far with our job, is that we are two out of only three divers running the shop. So it is a little bit tricky for both of us to take time off at once. Fletch magically arranged the time off for us though, and the day before our anniversary, one of our boat captains drove us north about 45 minutes to another island in the Mamanuca group called Tokoriki. 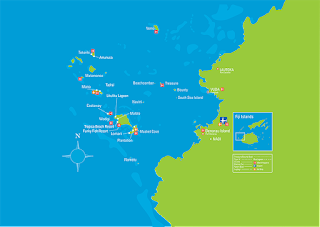 This is the Mamanuca group of islands in Fiji. (Image found on Google). We now live on Mana Island. For our anniversary we went north to Tokoriki. The beauty of living on a little patch of sand is that you don’t need shoes. I have a pair of shoes, hidden away in our room somewhere. I have to dig them out every now and then when we go back to the mainland, but aside from that I run around barefoot, with sand between my toes pretty much 24/7. Yes, I actually have a job that I get paid to do and never have to put on shoes for. That is my definition of happiness. As we were just jumping over from one patch of sand to another, Neither of us bothered wearing or, for that matter, bringing shoes. For our first anniversary we had dinner barefoot by the sea. For our third we took a whole trip barefoot because, why not? Our life is rough. We pulled up to a pretty, white sand beach where a man in his work sulu (the Fijian sarong) greeted us with wooden necklaces and welcome drinks. He led us past the dive shop, where we met the dive instructor, past two pools, one saltwater, and one a chlorine infinity pool, that from our viewpoint ran seamlessly from pool into ocean. Beach chairs with turquoise cushions that doubled as pool floats were scattered comfortably around. He led us into a big, open reception area where the band greeted us with the customary Bula song as we completed our checkin. We were lead through perfectly manicured lawns and beautiful gardens in full bloom, past the orchid greenhouse, around pools of lily-pads, to the far end of the resort where our villa was located. A heavy wooden door swung open, welcoming us into a well lit and open living area, with large balcony doors looking out over our own private pool area with steps leading down to the beach. Adjoining the living space, was a luxurious bedroom. The entrance was guarded by a black, wooden figure of a man hanging on the wall, which made me think my wetsuit was hanging there every time I walked past. (Shows you where my mind is at). The bathroom was complete with both an indoor, and an outdoor shower, beautifully surrounded by curving rock walls. We were in our own little piece of paradise. That’s a terrible analogy, we are always in our own little piece of paradise. We were in our own little slice of 5 star luxury treatment for a few days. To top off the princess pampering, we headed to the opposite end of the resort where the spa was located. Not just for a massage though, but for… (are you ready for this?) An unlimited massage package. Yes, that is a thing. And Fletch telling me that we were in for a weekend of unlimited massages was better than telling a kid that they had unlimited access to the toy and candy stores. Unlimited massages. I don’t want to be obnoxious and keep repeating myself but the words are just so delightful. Unlimited massages. We joked on our stroll to the spa that now that we had this package, they were probably going to be completely booked full. Luckily they weren’t. We stole the last two spots for that day, and spent the next half an hour indulging in foot rubs. The spa was a lovely little area on a hillside, surrounded by jungle that made us feel like we were escaping from the heat of the sun into the cool of the middle of the rainforest. The massage ladies led us up a curving set of stone steps, and into an open room, with a rock wall with water cascading downwards. The sounds of trickling water lulled us into a sleepy afternoon daze while two Fijian ladies rubbed our feet. Day beds and lounge chairs galore. We spent a few hours relaxing next to our private pool, sunbathing, and taking full advantage of more privacy to even out the tan lines than we had had since living in Palau. Before dinner we returned for another round of massage bliss. This time, with an entire hour to enjoy, the options were greater. I chose a bamboo massage, a novelty I have never seen anywhere else. It turns out that if you are a small girl without much surface area, there are not very many places to roll a tube of bamboo over. But that’s the beauty of unlimited massages, (ok I promise I’ll stop saying that. Soon...), you can try the things you might not have tried otherwise. After massages, we relaxed by the resort pool and watched the sun set, while sipping berry mules and watching all the Chinese couples take their various photos complete with wardrobe changes. Dinner was a delectable meal. We sat tucked away at a little table for two behind all the other dozens of tables for two. The entire atmosphere of Tokoriki was very romantic, although it was slightly humorous to break out of our little romantic bubble and realize that the resort was a perfect churn-mill for dozens of other cookie cutter romantic experiences. The actual day of our anniversary arrived and we made our way to the dining area for a lovely buffet spread of fruits and breads and cheeses. I was ecstatically happy to be able to order a cappuccino. It’s the little things you start to miss. After breakfast we made our way down to the dive shop where our transport was waiting to take us on a snorkel and picnic trip. That was all I knew about what Fletch had planned, that it involved snorkeling and a picnic. We joked that we would probably be going to Sandbank. Sandbank is a little blob of sand next to Mana Island. It has an atoll surrounding the whole thing, so we go there as a dive site. Sometimes guests arrange to camp out there for the night, or just go for a picnic in the afternoon. It is a perfect place to go if you just want some sand to yourself. The boat brought us not to Sandbank, but to a proper island called Monu. 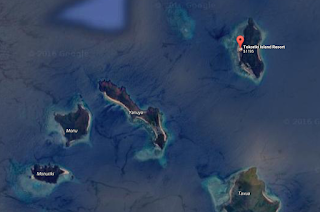 To give a little perspective, the next island over, Monuriki, is where the movie Castaway was filmed. So our boat captain brought us to this island, and proceeded to unload picnic blankets and pillows and a large cooler full of food. He also handed us a small first aid kit with a cell phone inside, and then jumped back onto the boat and sped away. We had our own private beach for the afternoon. I was delighted. Fletch and I wasted no time in pulling out our long fins and going for a snorkel. 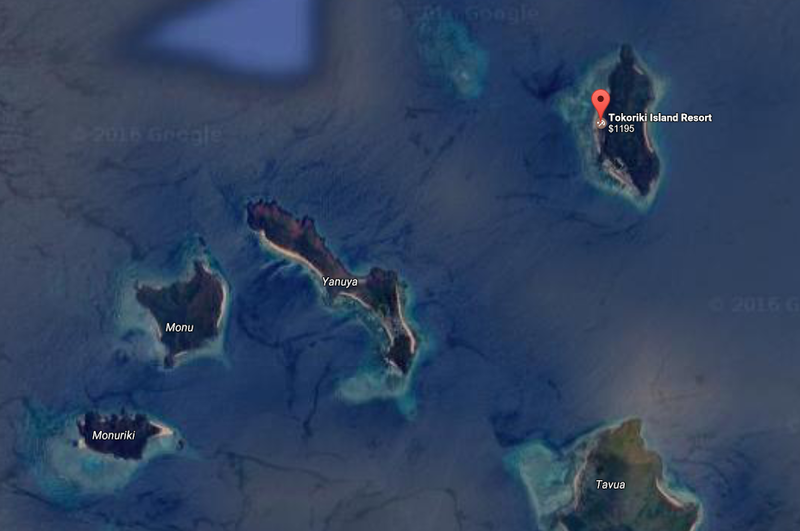 Here is a screenshot from Google Maps of Tokoriki island where we were staying, Monu Island where we were dropped off for the day, and the neighboring Monuriki Island where the movie Castaway was filmed. 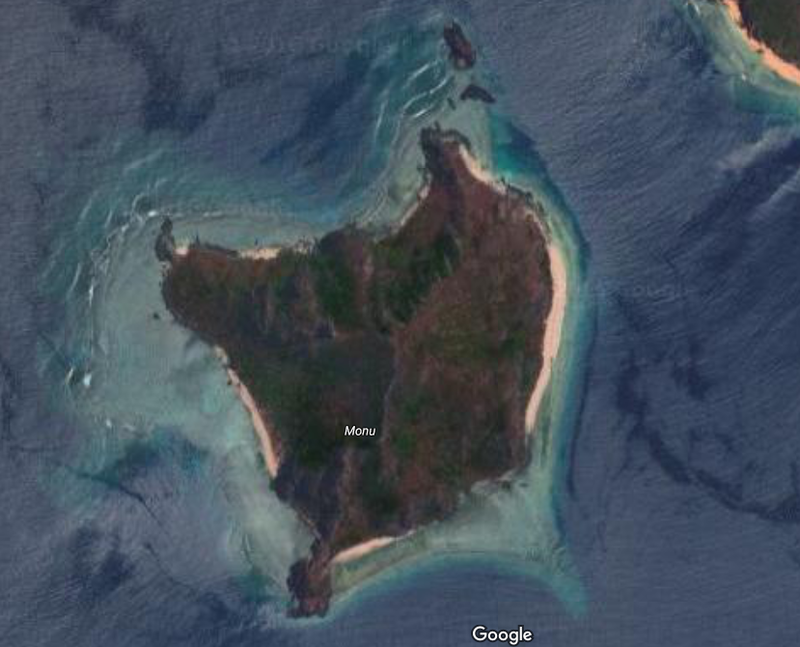 Another screenshot from Google Maps of Monu Island. We were 'stranded' on the east stretch of beach, and ended up snorkeling all the way up to those rocks on the north point. Our view of Mana Island, our home in the distance. The area where they dropped us off was a pretty perfect beach, with crystal clear blue water, but the clearest of water is where there is no life. We could see straight down to the sandy bottom, but there was no coral in sight. So we meandered our way north along the coast until we found an area where there was a little more coral to be seen and a few white tip reef sharks slinking their way along the bottom. We made it all the way to the rock, where I found a few species of fish I hadn’t seen before. Before we knew it, we had roasted our backsides in the sun, but were too happy to care. We made our way back to the spot on the beach where a little thatched roof provided some shade to our cooler full of goodies. We opened the cooler and unpacked a feast of fruits and salads, shrimps and cheeses, breads with butter, and a bottle of champagne. We were a far cry from experiencing our own Tom Hanks moment. Later that day, one of the owners or managers or someone of importance told us with humor that a lot of people who sign up for that trip, usually leave some of their food, just incase they really do get stranded there. We weren’t too worried about getting stranded. They had given us a phone, we had our own phones, and a village across the channel was a feasible swim away. A dinghy pulled up with a couple who got off and started strolling along the beach. We eyed them suspiciously, as they seemed very out of place. Our own pickup came along a short while later and saw the couple with the dinghy. Our guy told them off for being on the beach. Apparently this was a private beach that Tokoriki had purchased specifically to be able to strand paying customers there for their own Castaway experience. When we made it back to the resort a sea-spray-filled boat ride later, we beelined for the spa for our next round of getting rubbed from head to toe in delicious smelling coconut oil. I ditched the idea of getting poked with a bamboo stick and went instead for the traditional Fijian bobo massage. It was much more to my liking. I was so relaxed, that much to my embarrassment, I must have dozed off momentarily mid-massage, because when all was said and done, my lady said she had heard a little snore. For our anniversary dinner, my prince charming booked a seafood dinner by the sea. We were escorted away from the cluster of couple tables, and down to the beach, where three little platforms were set up, spaced well apart, with tables dressed in linens and fire-lit lanterns. We were just in time to watch as the sky turned a dazzling shade of pink followed by purple. The sun dipped behind the shadows of the island in our immediate view, and the last rays of colorful light reflected brilliantly off of the ocean’s surface. Dinner was an elaborate six-course affair accompanied by a bottle of red wine. The amuse bouche was simply a bite to wet our appetites, followed by an hour wait while we anxiously craved the next course. Chilled poached tiger prawns made their way to the table at long last, followed by another hour long wait. The rest of the restaurant must’ve been very busy. A delectable plate of tuna tataki eventually found its way to us, followed by salt & pepper calamari and pan fried baby octopus. I have had plenty of baby octopus in my travels, it is very delicious although sometimes a little chewy. I had come to think that the chewiness was just a part of the textural experience, but not this pan fried baby octopus. This was so tender and delicious that it was more like biting into a ball of mochi. I savored every little bite, not wanting it to end. At this point the band made their way around to each of the three little individual platforms to give a private performance to each couple. In Fiji, singing is a national pastime. Everyone sings from a young age, and it is as though they are all naturally gifted with the most beautiful voices. I was walking home from work the other day, and walked past the school, where three of the little kids where sitting outside on a bench playing, and absentmindedly singing the Cups song from Pitch Perfect in perfect harmony. I couldn’t help but slow down my walk to listen it was so good. And not to sound like a stuck-up scrooge, but I had a very strict classical music upbringing, so I don’t dole out musical compliments easily. I’ve never heard an entire group of people so naturally gifted with beautiful voices though. The only food I actually stopped to take a picture of before indulging my taste buds. The real courses were too good to wait. We were serenaded, and I felt slightly obligated to turn my attention towards the music instead of the mouth-watering baby octopus sitting in front of me. The rest of the restaurant must have finally slowed down, because the servers took my moment of not eating as a cue to clear my plate and I had to pull it back away from them. A whole hour between all the other courses and now they wanted to hurry me through the best one. No way. A small bowl of sorbet arrived to cleanse our palates for the main course of lobster. The lobster came with a side of salad that I was nearing being too full to eat. I didn’t feel bad leaving it as we had had the same salad for lunch. Another long break came before the final dessert course. By that time Fletch and I were laughing at how long dinner was taking. Although it had been lovely, we were ready to be done of the dining experience. Even the best of things can drag on for too long. Dinner had been a feast to remember. But all the other couples had long ago drifted off to enjoy each others company instead of sitting at the same table they had been at for the past several hours. If you are finding this blog after searching for information on Tokoriki Island Resort, know that the seaside dining experience is an incredibly long affair. The following morning we awoke early for a final massage appointment, which put us in a happy and relaxed daze for the rest of the day as we made our way back to Mana Island. You know life is good when you can have a luxurious, romantic weekend such as that wonderful anniversary gift that Fletch planned for us, and still be just as happy to go home at the end of it. Both of us were beaming with smiles as we made our way back to Mana Island, happy to go back to our chilled, relaxed, barefoot life.